On DVD: "Six in Paris," "Arch of Triumph"
Six vignettes set in different sections of Paris, by six directors. 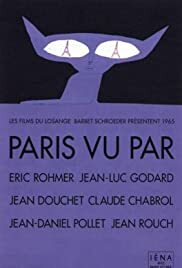 St. Germain des Pres (Douchet), Gare du Nord (Rouch), Rue St. Denis (Pollet), and Montparnasse et Levallois (Godard) are stories of love, flirtation and prostitution; Place d'Etoile (Rohmer) concerns a haberdasher and his umbrella; and La Muette (Chabrol), a bourgeois family and earplugs. Some of the names here are bigger than others. Godard is the biggest, with Chabrol probably the next in line. How big any were at the time I don't know, but now (2016) this makes for a nice sampler of different styles in what is called the New Wave. Tales of Paris seem very appropriate, and almost anticipate later films where New York is very much a subject.